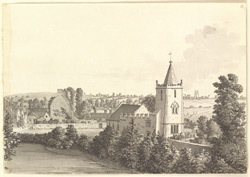 This sketch shows Corston Church in Somerset, with a distant view of the church tower at Newton St Loe, taken from a window of the parsonage at Corston. The church's chancel and nave date from the 13th century. The west tower is low and battlements and an octagonal spire were added at a later stage.